In person, Gulla Jónsdóttir is as fabulous as her work is fierce and quite frankly put, a force to be reckoned with. Based in Los Angeles, California she heads up her own firm, Gulla Jónsdóttir Architecture + Design which she set up in 2009. After years of designing hotels from LA to Hong Kong, private residences in California and New York, restaurants in Paris and Mexico, a superclub in Beirut and a skyscraper in Dubai, the infamous designer has a portfolio that puts her on the map as one of the 21st centuries most skilled and sophisticated engineers of design. Growing up in Reykjavik, Iceland she left for LA where she studied architecture as an undergrad in SCI-Arc. Following in the footsteps of those who truly succeed in their trade and ultimately find their own path, upon graduating she sought out the greats and looked to learn from those who inspired her. After years of creating as part of incredible teams at Richard Meier & Partners Architects, Dodd Mitchell Design and Walt Disney Imagineering she now takes pleasure in leading her own team and continuing her work which now inspires and ignites the lives of all who enjoy her creations. I was thrilled to chat with Gulla and discuss where it all began, her inspirations and aspirations, taking in exactly why this visionary has been hailed as the new Zaha Hadid. Gulla, where did your love of design begin? In Florence Italy when I was 12 years old. I was mesmerized by the beauty of the city and the arts. Architecture and design are undoubtedly one and the same, merging aesthetics with structure, formational with the ornamental. Was it a natural evolution for you to move away from straight architecture to what you do now? I am still very involved in architecture and especially architecture with artistic integrity, this is my first passion and design is my second passion and indeed a very fluid transformation from architecture. There is no limitation to creativity so whether I'm designing a skyscraper, interiors or a piece of furniture, it's only a different scale and mindset to me, but it all relates to the same DNA of site-specific beauty that can complement its surrounding nature. What was your first job in the industry and what stands out to you as some of the most important lessons from early on in your career? I was very lucky with my first job and grateful to land a job right out of architecture school at Richard Meier's office working on the Getty Center Museum; then the largest project in California. I learned so much from Richard Meier and I still appreciate his work and how peaceful it is. There is an element of elegant geometry in all of his work and since I majored in mathematics before studying Architecture this very much appealed to me. Your work takes you around the world, what’s been your most exciting project to date? There are many and I feel like they are all like my children, just living in different cities. I like working in Mexico and my recent project there, Comal at the Chileno Bay Resort and Residences in Cabo, is very close to my heart. So is the Macau Roosevelt in Macau China, which is the first ground-up hotel I designed under my own company name; a 368 room lifestyle resort which just got an award as the Best Resort Design 2017 from Interior Design magazine. When working on projects abroad, how important is it to bring about contextual elements to your creations? It's very important to me! It's the first concept I start working on with each location. I like to walk around the site, scope for natural elements that can influence the design and always prefer to use local materials and handcrafted local furniture whenever possible. 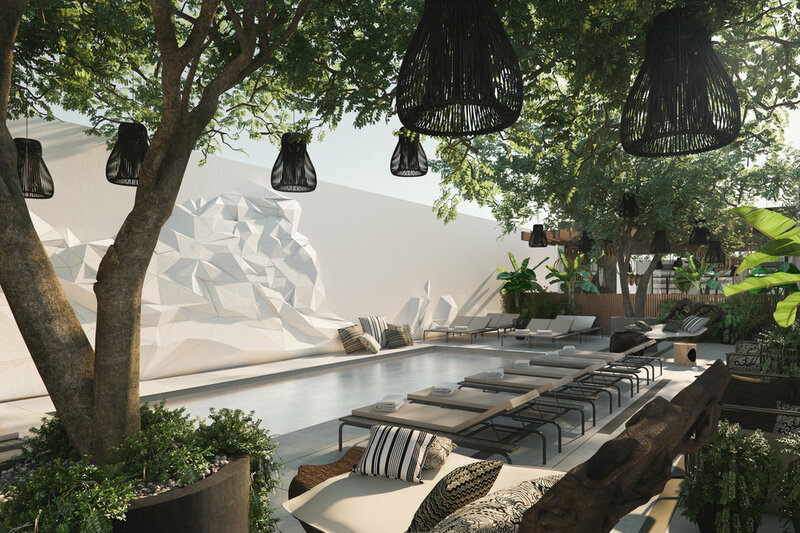 The new Kimpton La Peer hotel in L.A is your latest gift to the world. Could please explain the creative process involved in such a huge work of art.. This project is particularly dear to me as it is the same location as the studio I started in 2009. We have taken it step by step for the last few years through careful consideration of the neighborhood, and fellow artists and artisans are installing a piece of their energy and soul in the project and in the end I feel like we have succeeded in our tempt of creating a symphony of the arts for the neighborhood in a very comfortable setting that can feel like your home. How do you balance consistency in your work as a designer while never letting your ideas become repetitive? I follow my heart and I believe that design comes from within. The exciting challenge derives from creating something new for each project and this is what drives me. Always. I hear you’re working on a jewellery line too, can you tell us a little about it? The jewellery line came organically as looking at a 3D model of a facade I previously designed but didn't get built. Rotating it around I thought it could look like an interesting ring. We test printed it in 3D and gold plated it and it feels good so this is the beginning of something more brewing that we will launch later this year. You have a great sense of style and are always dressed so beautifully, has fashion had an impact on your story thus far? I believe high fashion is an art form so yes sometimes it does inspire me. I can see a flowy fabric and imagine it in a solid concrete shape and so forth. Where do you feel the world’s of art and fashion collide? Do you consider them to be one and the same? The real haute couture in terms of artists such as Yves Saint Laurent, Alexander McQueen and others in that calibre is in many ways equal to fine art, the only difference is that it is wearable for your body and other art is sometimes a social and or political statement or for its pure beauty and storytelling. What they have in common is beautifying the world with creative energy. That is such a beautiful way of explaining it. Wow. What does a day in the life of Gulla Jonsdottir look like? I wake up around 8 am and make an espresso, shower and answer emails at home, although my New Years resolution is always to start with meditation instead of looking at my phone.. ( one day.. ! ). I arrive at my studio around 9:30 am and catch up with my team and clients and walk down the street to get a delicious almond milk cappuccino. Late morning I visit my nearby projects that are under construction in West Hollywood and downtown LA. Twice a week at lunch, I work out with my trainer at the park and usually eat a healthy lunch like a salad with salmon or chicken at my desk. In the afternoon I have conference calls and continue on designing, sketching new and ongoing projects and thankfully no day is the same when you work in a creative environment. Right now we are working on our first atelier which will be inside one of the hotels I'm designing so this is a new exciting challenge for us and a new business that I will invite other artists to participate in. Late afternoon I call my mom in Iceland before she goes to sleep, text with a few friends and by 7 pm its time to grab a glass of wine with friends or colleagues and some snacks at the bar and then I go home and pick up my suitcase that I half hazardly packed late last night, and catch my midnight flight to Hong Kong or anywhere the projects take me. I make sure to set up dinner with friends in that city when I land and happily turn off my phone because I refuse to believe there is wifi on planes and this is my time to do absolutely nothing. I love it. Is there a fundamental rule you live by, personally and professionally? To be true to my heart, genuine, loyal and honest. I sleep very well at night because I live an honest & peaceful yet adventurous life filled with very good people around me both in my personal and professional life and for them, I'm very grateful. How do you navigate between the public's view of you and your own private life? I'm always the same, I don't have a poker face and I treat everyone the same; with kindness. What are up-and-coming architects catching your attention right now? The architects in China are doing some fantastic things right now. I see a big growth in Asia in pushing the boundaries and exploring new forms and materials in a very interesting way. Is there something you dream of designing? A museum, a skyscraper and an Olympic stadium. ..and what building do you wish you had designed? What are your unfulfilled ambitions? Learning more languages fluently. I speak a few but I need to find the time to fulfil this ambition. If you weren’t a world-renowned designer, where would we find you and what would you be doing with your days? Interesting thought, wow. I think I would be a Sherlock Holmes or James Bond sort of a woman solving mysteries and travelling and then would retreat to my villa in Tuscany painting paintings and drinking red wine from my vineyard. Photographed below is Gulla's latest project, Kimpton La Peer Hotel which recently opened in West Hollywood, LA. Read more about Gulla's career on Haute So Fabulous here.